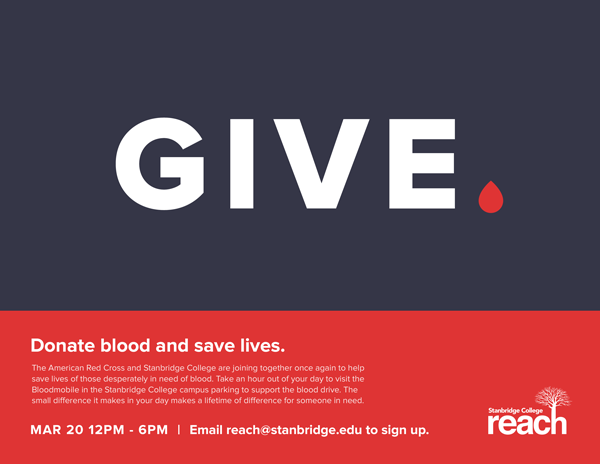 Stanbridge College is hosting its quarterly American Red Cross Blood Drive on March 20, 2014 from 12:00 p.m. to 6:00 p.m. Donors are needed to help those in need of blood transfusions. A single donation of blood has the power to save 3 lives. It is something that most people can spare; yet there is still a shortage, especially in the O-negative and B-negative blood types. To help overcome this shortcoming, Red Cross needs your assistance to give someone hope and save a life. Hospitals and trauma centers trust the Red Cross to deliver potentially lifesaving blood for accident victims, sick children, and cancer patients in need of transfusions. Again, we need your help – not just to stabilize our depleted blood supply – but also to immediately help patients in need. Volunteer to help the Red Cross with registration tasks on the day of this event. We need 2 volunteers for two 3 hour shifts from 12:00pm – 3:00pm and 3:00pm to 6:00pm. Please email smellinger@stanbridge.edu for more information. We can’t do this alone, but together, we can stand ready. Thank you for your support and dedication to helping those in need.